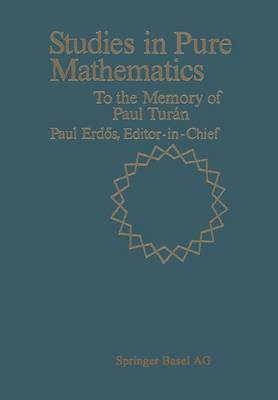 This volume, written by his friends, collaborators and students, is offered to the memory of Paul Tunin. Most of the papers they contributed discuss subjects related to his own fields of research. The wide range of topics reflects the versatility of his mathematical activity. His work has inspired many mathematicians in analytic number theory, theory of functions of a complex variable, interpolation and approximation theory, numerical algebra, differential equations, statistical group theory and theory of graphs. Beyond the influence of his deep and important results he had the exceptional ability to communicate to others his enthusiasm for mathematics. One of the strengths of Turan was to ask unusual questions that became starting points of many further results, sometimes opening up new fields of research. We hope that this volume will illustrate this aspect of his work adequately. Born in Budapest, on August 28, 1910, Paul Turan obtained his Ph. D. under L. Fejer in 1935. His love for mathematies enabled him to work even under inhuman circumstances during the darkest years of the Second World War. One of his major achievements, his power sum method originated in this period. After the war he was visiting professor in Denmark and in Princeton. In 1949 he became professor at the Eotvos Lorand University of Budapest, a member of the Hungarian Academy of Sciences and a leading figure of the Hungarian mathematical community.